The International Space Station is in the midst of a series of evening flights over the British Isles and Western Europe. You can obtain predictions of when and where to look for the ISS by using our interactive online Almanac as explained in the article below. 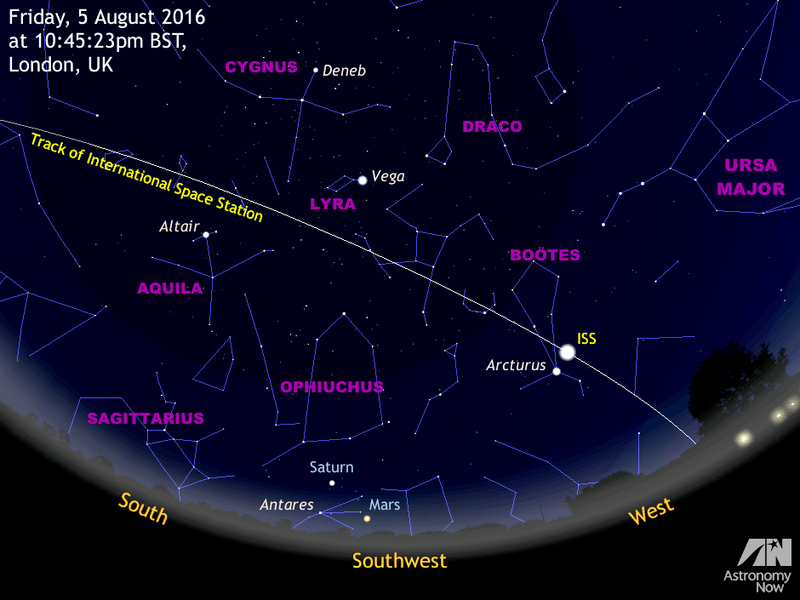 The graphic shows a wide-angle view of the ISS track centred on the southwest as seen from London shortly after 10:45pm BST on Friday, 5 August when the spacecraft passes close to bright star Arcturus. AN graphic by Ade Ashford. If you chance upon a bright ‘star’ crawling across the sky in an arc from west to east, an object that doesn’t flash or possess red and green running lights (which is an aircraft), then you can be fairly certain that you’re looking at the International Space Station (ISS). This vast orbiting laboratory can be observed from the heart of even the most light-polluted town or city, and its current orbital circumstances permit it to be well seen from the British Isles and Western Europe over the next few nights. Construction of the ISS began with the launch of the first module, Zarya, in November 1998. Since then, more than 115 constructional space flights using five different types of launch vehicles have led to the 73 x 109 x 20 metre, 400-tonne structure that we see today. The orbital outpost has been continuously occupied since November 2000 and has seen 224 visitors from 18 countries. 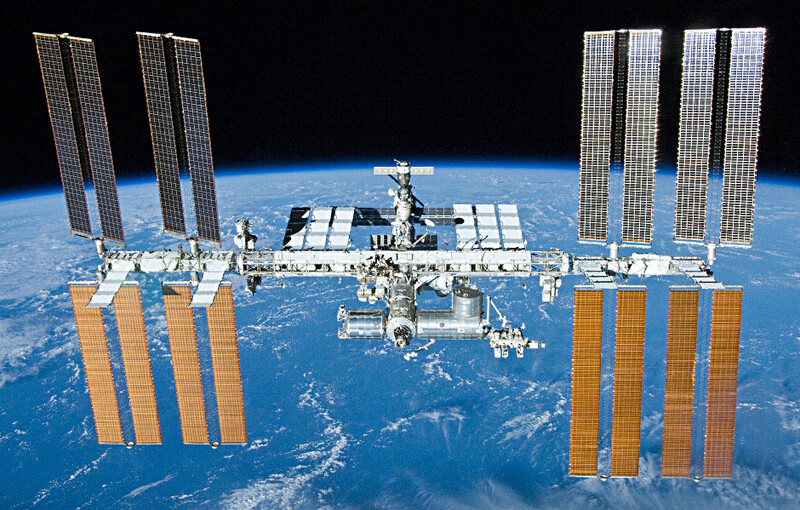 The International Space Station orbits the Earth every 92.7 minutes at an altitude between 254 and 258 miles, travelling at an average speed in excess of 17,000 miles per hour (7.5 kilometres per second). The ISS orbits our planet with an inclination to the equator of 51&frac23; degrees, meaning that it can appear overhead at all latitudes between 51.6° N and 51.6° S. As far as the UK is concerned, the ISS can be seen as high as the zenith at all locations south of a line drawn between Swansea and London, appearing lower in the sky for all places north of this line. In the Almanac, select the closest city to your location from the Country and City pull-down menus before ensuring that the box beside Add ISS passes? has a tick in it and — just as importantly — the Daylight Savings Time? box, if applicable to your time and location. The table underneath the month’s Moon phase data then shows current nighttime passes of the International Space Station over your chosen location during the next five days, if any. For the given Date in year/month/day format, Local Time is the instant the ISS first becomes visible and Duration indicates the length of the sighting in minutes. At the given Local Time, look in the direction indicated by Approach and, weather permitting, you should see the ISS as a slowly moving, bright ‘star’. Max. elevation is how high the Station will get above your horizon (90° is overhead, while 20° is about the span of an outstretched hand at arm’s length) and Departure indicates where the ISS will be when it vanishes from sight. Sometimes an appearance or disappearance occurs well up in the sky when the Station emerges into sunlight or slips into the Earth’s shadow, respectively. Here is a recent example computed for the centre of the UK: In the example above, as seen from the heart of the British Isles on the evening of Tuesday, 2 August, the ISS first appeared 16° (a span and a half of a fist at arm’s length) above the west-southwest (WSW) horizon at 10:09pm BST in a viewing window lasting five minutes. 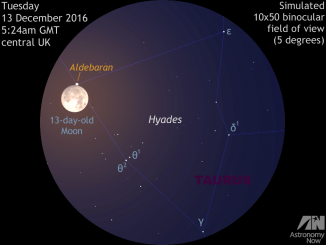 It attained a peak altitude of 50° above the south-southwest (SSW) horizon before sinking down to 15° above the eastern (E) horizon at 10:14pm BST. One orbit later, the ISS rose again at 11:46pm BST. Note: the actual times of events in the future will change as the orbit of the ISS varies over time; Almanac predictions made on the day are more accurate. 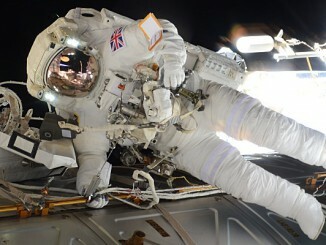 Viewing the ISS through a telescope? The International Space Station photographed through a telescope by astrophotographer Ralf Vandebergh of the Netherlands. 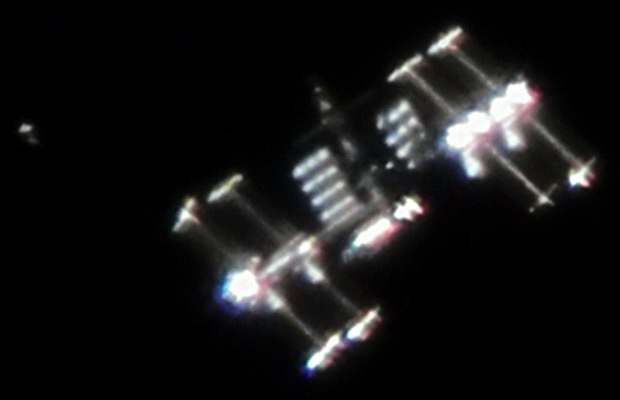 “The image shows not only the ISS with very special lighting angle but also it shows activity around the ISS which is often the case. You see the Japanese Cargo Ship HTV-1 in its demonstration flight shortly before docking and just a few hundred metres below the ISS,” he said. Image credit: Ralf Vandebergh / Wikimedia Commons CC BY-SA 3.0. Given the International Space Station’s physical size, proximity, and brightness (at its best it can rival Venus), one might suppose that it would be fine object to see through a telescope. Indeed, when passing overhead at a favourable orientation, it can exceed an arcminute in angular size — about the same as Venus close to inferior conjunction. In practice, trying to track the ISS with an undriven telescope such as a Dobsonian feels rather like clay pigeon shooting, as one attempts to anticipate where it will be in the finder before catching a glimpse as it flashes through the field a high-power eyepiece in a fraction of a second. However, practice makes perfect, and if a carefully focused astrovideo camera is used in place of an eyepiece, some frames on playback can contain tantalising images. Observers with computerised mounts that can be driven by external software designed to track satellites a have much greater chance of success. Astrophotographers Thierry Legault and Ralf Vandebergh have succeeded in capturing stunning pictures of the ISS showing fine structural detail that are an inspiration to imagers the world over. However, the serene beauty of the International Space Station sailing silently overhead needs nothing more than the naked eye or a binocular to appreciate. Furthermore, if you do make a sighting, contemplate the six-person crew of Expedition 48 that are currently aboard. 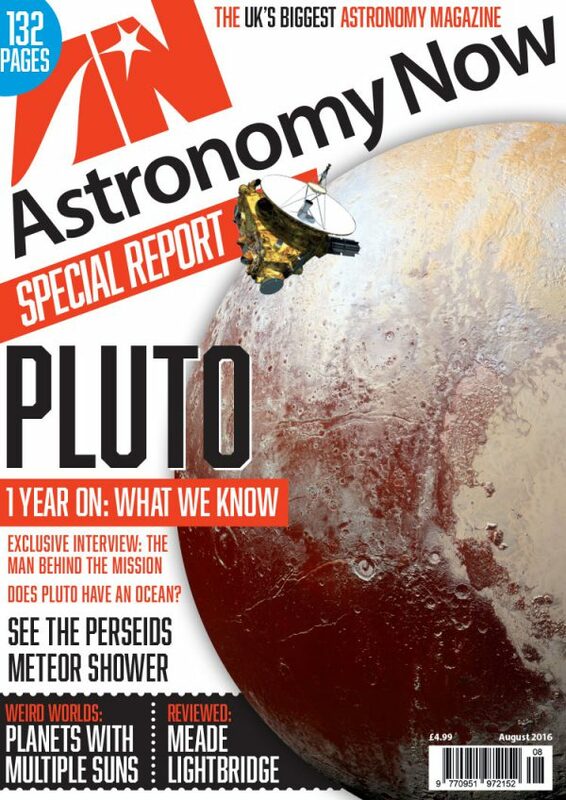 For a comprehensive guide to what is currently happening in the sky, obtain a copy of the August 2016 edition of Astronomy Now. 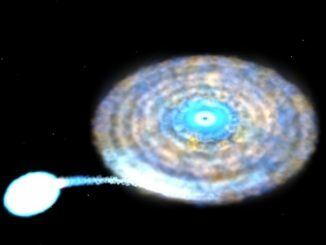 An instrument aboard the International Space Station has detected a binary star system made up of a fast-spinning pulsar and a compact white dwarf that orbit each other every 38 minutes, a record for an accreting millisecond X-ray pulsar.